Ended her senior season by ranking among the top four players in the Seminole lineup in seven major categories including solo blocks (27-1st), assisted blocks (167-1st), total blocks (194-1st), blocks/set (1.55-1st), hitting percentage (.256-3rd), service aces (20-4th) and kills (170-5th) … closed out the regular season by ranking second nationally in total blocks (192), nine off the pace set by Ali Bastianelli (Illinois) … had the fifth-best block/set average in the nation as she began the NCAA Tournament (1.59), also behind Bastianelli … led the way for a Florida State front row that ended the regular season ranked seventh nationally in total blocks (348) and 13th in blocks/set (2.85) … a dominant defender for the Seminoles, Keil finished atop the Atlantic Coast Conference in blocks (192) and blocks per set (1.59) in 2016 … she was 0.24 blocks per set better than Sydnye Fields (North Carolina) and Leah Levert (Syracuse) to end the regular season had a 33-block advantage over Jenna Potts (Pittsburgh) … caps off her career, which includes two seasons with the Seminoles, with 384 kills (1.24 kills/set), a .279 attack percentage along with 479 total blocks (46 solo blocks / 391 assisted blocks / 1.31 blocks/set) … finished with 10 assisted blocks and three solo blocks, while recording seven kills at UCF (Aug. 27). Highlighted the Florida State unit that combined for 19 team blocks and along the way established the program three-set, rally scoring record for most blocks in a match since the NCAA moved to a 25-point format in 2008 … anchored the front row for the Seminoles against No. 16 Texas A&M (Sept. 1), closing with 12 assisted blocks … came away with eight kills and seven blocks (six assisted) in five sets against Alabama (Sept. 2) … tied her season-high in kills (eight) in four sets against No. 6 Minnesota … established a new career-high in kills (10) as she posted a .364 attack percentage in a five-set win over Baylor (Sept. 8). She was also active on defense for the Seminoles with nine assisted blocks, a season-high … key cog in the FSU defense, posting one solo and two assisted blocks against Little Rock (Sept. 9), as she snagged All-Tournament honors at the Home2Suites by Hilton Tallahassee Seminole Tournament after recording 22 kills and 13 blocks (11 assisted) … finished with at least five blocks (eight total blocks) for the fifth time this season as she highlighted a Florida State front row that finished with 21 blocks against LSU (Sept. 18) … posted six blocks (five assisted) against Miami (Sept. 23) as the Noles finished with a 15-5 advantage in blocks … tallied five blocks (two solo) as FSU limited Louisville to a .159 attack percentage (Sept. 25) … contributed five kills, four digs and an assisted blocks in a sweep of Syracuse (Sept. 30) … finished with seven total blocks (one solo), led the way for the Seminoles’ defense unit that tallied 25 assisted blocks against Boston College (Oct. 2) as they held the Eagles to a .028 hitting percentage … had .400 hitting percentage performances at North Carolina (.400, Oct. 7) and NC State (.462, Oct. 9) as she recorded five and seven kills, respectively, in the first two ACC road matches of the season for the Noles. Her outing against the Wolfpack also included seven assisted blocks which led the way for an FSU front row that recorded 22 assisted blocks as a unit … recorded five assisted blocks (six total blocks) as she provided FSU with a 17-13 edge in total blocks in a five-set win over Virginia Tech (Oct. 14) … anchored the Florida State front row with 11 total blocks, including eight assisted, as the Seminoles held a 34-9 edge in total blocks against Pittsburgh (Oct. 16). Keil topped double figure total blocks for the third time this season and first time against an ACC opponent … led the way for the Seminole defense with nine blocks (one solo) as FSU posted 17 total blocks … capped off a clash with Louisville (Oct. 30) with eight blocks (seven assisted) along with three kills … had multiple solo blocks for the fourth time this season as she finished with five blocks (two solo) against Notre Dame (Oct. 30) … made nine of Florida State’s 36 assisted blocks against NC State (Nov. 4) … capped off a five-set affair with No. 12 North Carolina (Nov. 6) with seven blocks (six assisted) … finished with eight kills (.500 attack percentage) and six blocks (five assisted) against Boston College (Nov. 11) … opened the final regular season road series of the season with nine blocks (eight assisted), four kills and three digs versus Duke (Nov. 18) … was a valuable presence at the net for Florida State as she came through nine blocks (eight assisted) and six kills in a win over Wake Forest (Nov. 20) … responsbile for four kills and four total blocks (three assisted) against Clemson (Nov. 23) … converted eight blocks (two solo) and seven kills in a five-set win versus Georgia Tech (Nov. 25) … converted five kills, four assisted blocks, two digs and one service ace as Florida State earned a four-set victory over Cincinnati (Dec. 2) to open the 2016 NCAA Tournament … responded with five kills (.308 attack percentage), five blocks (four assisted) and the match-decisive service ace as the Seminoles completed a five-set come-from-behind victory over Florida (Dec. 3) … ended the season with five kills, two blocks and one assist in a four-set clash with Stanford (Dec. 9) at the Sweet 16. Enjoyed a solid first season in the Florida State lineup and was one of six Seminoles with at least 100 kills (132) in 116 sets (1.14 kills/set) … created one of the most formidable front row combinations in the ACC, alongside Sarah Burrington, as she finished second in solo blocks (11) and total blocks (137) during the regular season … made 86 total blocks (80 assisted / six solo) against ACC foes, all placing her second on the team to Burrington … guided the Seminoles to 370 total blocks (634 assisted blocks / 53 solo blocks) which marked the third straight season Florida State had at least 500 assisted blocks (572-2013, 588-2014). 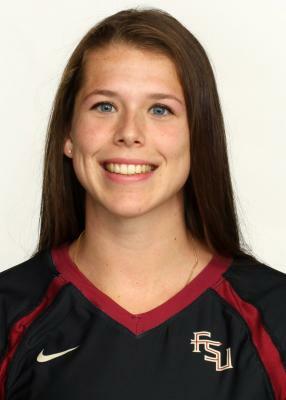 It is the most consecutive 500 assisted block seasons since 1986-89 when the Noles combined for 2,551 assisted blocks by posting 684, 709, 524 and 634 in succession … opened her Florida State career by combining for 16 kills, 15 assisted blocks and four digs at the Omni Hotels Colorado Classic (Aug. 28-29) … garnered All-Tournament honors in the Aloft Seminole Invite as she finished with 18 kills, 15 assisted blocks and five digs against the likes of Coastal Carolina, Florida A&M and Xavier. That included one of her best individual performances of the season (nine kills / five assisted blocks / .818 attack percentage) against Coastal Carolina (Sept. 11) … integral part of a front row that finished with a 30-8 edge in assisted blocks against Florida A&M as she finished with eight … opened ACC play with six kills and three assisted blocks against in-state rival Miami (Sept. 23) … converted eight assisted blocks in a sweep of Georgia Tech (Oct. 4) … drove home nine kills to go along with five assisted blocks in a five-set win at Duke (Oct. 9) … had multiple assisted blocks over a stretch of 10 straight matches, beginning with a clash against North Carolina (Oct. 16), when she finished with seven. During that stretch she had seven assisted at Pittsburgh (Oct. 30) and a season-high nine against No. 22 Louisville (Nov. 15). … capped off a three-set win against Virginia (Nov. 8) with eight kills and a .538 attack percentage, second-most kills in league action … part of a Florida State front row that had a 22-10 advantage in assisted blocks as she made three assisted blocks (vs. Arizona State) … made seven assisted blocks against Florida (Dec. 4) as she ended the season with at least two assisted blocks in her final four matches of the season. Played in 22 matches, making 13 starts, where she amassed 60 kills and 11 digs … posted 1.22 kills and 0.94 blocks per set … had a career high eight kills against Bakersfield in the Flyer-Raider Invitational and again vs. Iowa (Sept. 24) … had five or more blocks three times in 2014 … posted a career high eight blocks in the match against Denver … also a member of the sand volleyball team in 2014. Appeared in 15 matches, garnering five starts … became a regular in the rotation late in the season, playing in 10 of the final 13 matches … had six kills on 12 swings with no errors against Iowa … tallied six blocks against Indiana … came off the bench in the NCAA Regional Final against Texas and contributed five kills on nine attempts with no errors for a .556 percentage. Played for the U18 and U19 German National Team, competing in 70 national team games … earned Best Player honors at the 6 Nations Tournament in Belgium, as her team went on to finish first in 2010 … also finished first in the 8 Nations Tournament in 2011 … competed at the European Championships in Ankara, Turkey, finishing fourth in 2011 and fifth in 2012 … was also a member of the 2010 World High School Championship team … her club team finished second in the German Championships in 2009 and 2012, while finishing third in 2010 and sixth in 2011. Born May 7, 1994 … daughter of Nancy and Jürgen Keil … has one sister, Jessica … majoring in dietetics.